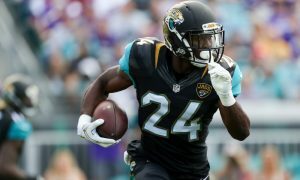 Say goodbye to the unit that took the field in 2018. 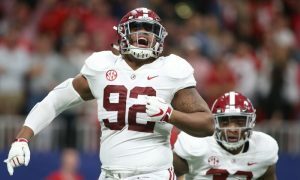 For the University of Alabama, its defense under Nick Saban and coordinator Pete Golding owned the stage during Saturday’s spring game. 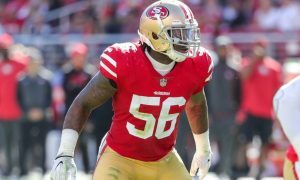 After having issues in the secondary and linebackers out of place last season, the group looked much better in front of 60,000+ in attendance. 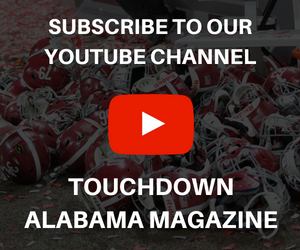 While a mystery lingers at inside linebacker – opposite Dylan Moses – the combination of Joshua McMillon, Jaylen Moody and Shane Lee did something to draw the attention of coaches and fans at Bryant-Denny Stadium. McMillon, a senior, tied with Xavier McKinney for team White’s leader in tackles (seven) and had one for loss. 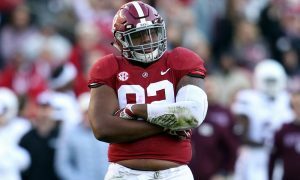 The 6-foot-3, 237-pounder stuffed the attack of Najee Harris (23 yards, nine carries) and Jerome Ford (two yards, six carries). Moody and Lee, both freshmen, record one interception each. Moody returned his for a 30-yard touchdown off Paul Tyson, while Lee anchored team Crimson in tackles with eight. In terms of the defensive line, all four quarterbacks faced serious pressure. Twelve sacks were accumulated between both groups — including two sacks each from the trio of Phidarian Mathis, Chris Allen and Antonio Alfano of White. 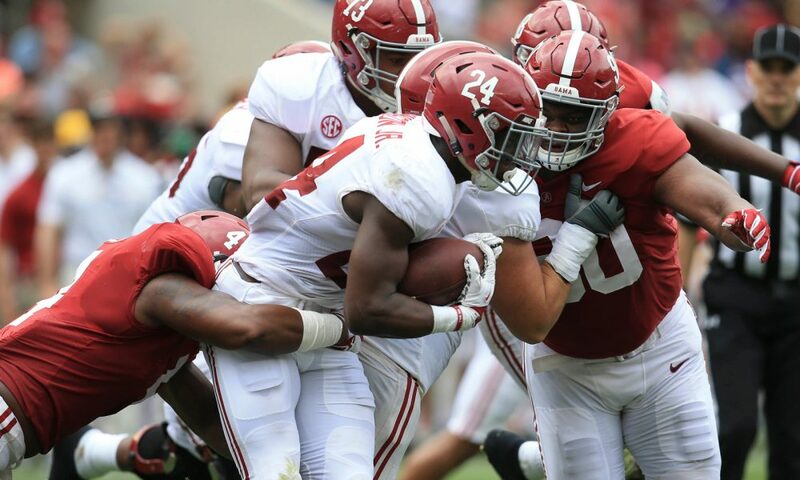 Edge rushers Anfernee Jennings and Eyabi Anoma harassed Tua Tagovailoa all game long, and two true freshmen in D.J. Dale and Justin Ebiogbe each collected one sack. Even the secondary, under the leadership of Karl Scott (cornerbacks) and Charles Kelly (safeties), was highly active throughout the exhibition. Trevon Diggs and Eddie Smith both had one pick. Josh Jobe, a sophomore, was able to frustrate the first-team group of receivers. His tight coverage and length at 6-foot-1 forced a game-high three pass breakups to go along with four total tackles. The native of Miami, Fla., had a great spring and used at both corner and star (nickel) throughout practice. His experience last year will go a long way with him becoming a major factor in the rotation. 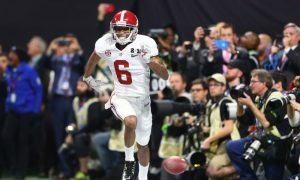 With Xavier McKinney back as a junior, the defensive backfield stands as a huge strength for Alabama football next fall. 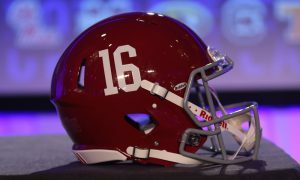 Hiring the likes of Sal Sunseri, Brian Baker and Kelly has already placed the Crimson Tide in a much better position to stack up well versus the rest of college football. 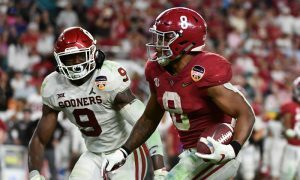 Defense earned White a 31-17 win; however, Saban also wants defense to be the staple of this latest push for more national championships.